Any travel agent can issue a ticket or book a cruise . . .
We create Travel Experiences . . . that extra effort is our hallmark! When I was in Melbourne, one of the highlights was taking a Savannah Walkabout Tour with Echidna Walkabout. 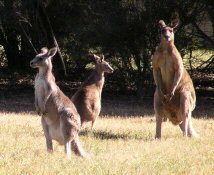 One of the fun experiences of coming to Australia is meeting the Australians, who have a passion for their country and are willing to share that passion with you. 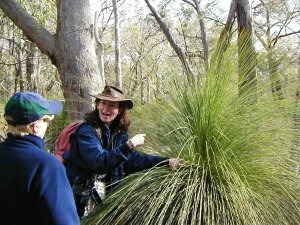 Since 1993, Echidna Walkabout has been providing high quality nature experiences for small groups throughout Victoria and south east Australia. Their tours are fully guided and catered by the owners of the company, Janine Duffy and Roger Smith, or by Belinda Pearce, one of their trusted guides. When you tour with Echidna you will discover the real Australia, and they will educate you about the animals in the bush, with whom they have a personal relationship. Janine's enthusiasm for these animals (she knows them by name) is unequaled and she has many stories to share with you about them. She is also a wonderful wildlife artist and three of my prized possessions are sketches of the animals done by Janine. Also, Janine and Roger have been conducting Koala Research since 1998. 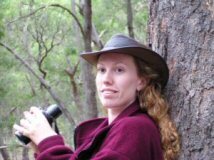 They visit the koala sites three times a week and also regularly stay in the bush for extended research, so their knowledge of native wildlife is extremely comprehensive. Below are a couple of videos and photos to give you some idea of what your day would be like with their company. Their company is also a Gold Winner in 2014 of a World Responsible Travel Award for "Best for Wildlife Conservation". Janine has discovered that each koala has a unique noseprint. 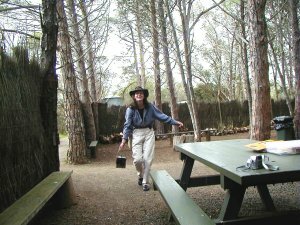 Here is an interview with Janine where she talks about her discovery. 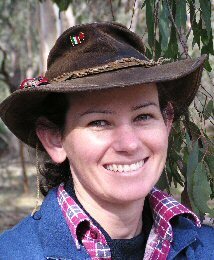 Janine Duffy is the owner of Echidna Walkabout. Above is her partner, Roger Smith and one of their tour guides, Belinda Pearce. An echidna is a marsupial who is carried in its mothers pouch. Below are some photos of my experience on their Savannah Walkabout tour. 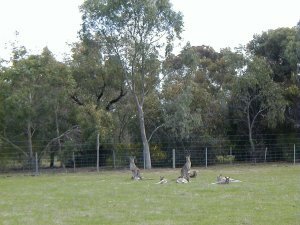 We saw kangaroos and koalas in the wild and dined in the bush! Janine and Roger and their guides know where to find the animals and have all sorts of stories to tell. 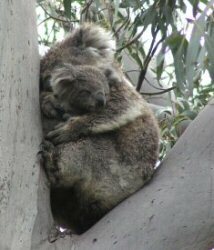 Daisy and her baby Lacka in a gum tree. 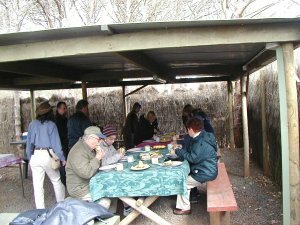 Below, our bush lunch at their camp site with Janine explaining to the group about the making of "billy" tea. 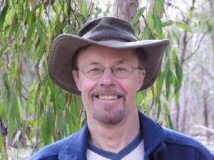 ("Billy" is an Aussie word meaning the metal container used to boil tea in the bush.) This tour and many others can be booked by our company so you, too, can experience a wonderful time with Echidna Walkabout. Janine explaining to a member of our group about some of the plants you find in the bush. Janine is so passionate about her koalas that she has named them. She has also established the Koala Clancy Foundation, a nonprofit incorporated association. 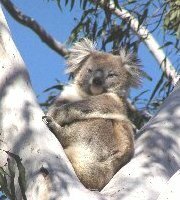 The Foundation began in July 2015 in response to guests and locals who have been helping with the research and habitat improvement ... and increasingly they wish to contribute more to ensure there is a future for wild koalas.